Fig. 1: Dry and swollen state of the material Moisture and the sensations associated with dampness on the skin and in cloth¬ing are fundamental to discomfort. High vapour concentrations in the skin-cloth¬ing microclimate, and more so liquid moisture on the skin or in clothing, lead to sensations of clamminess and sticki¬ness during wear. A new patented spun, characterized by high sweet absorption, was obtained combining cellulosic or synthetic fibers with natural or synthetic hydrogels in fiber form. 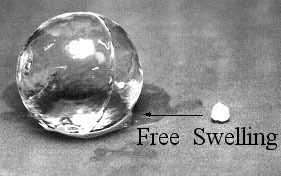 Superabsorbent hydrogels are polymers chemically crosslinked able to absorb up to 2 litres of water per gram of dry material (figure 1). The result is a technical thread that guarantees elevated comfort in all conditions where skin sweat is involved. Tests lead in laboratory show, for the new technical spun, a greater ability to absorb saline solution if compared with cotton. 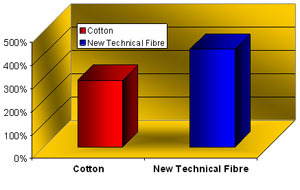 The figure 2 above shows the absorbed water saline solution respectively for cotton 100% and the new technical thread. Test carried out to verify the material resistance to the washing process has given positive outcome.